In the early days of the Soviet Union, the Bolsheviks used mobile cinemas as a vehicle for political propaganda. These days, Scotland also has a mobile cinema, but here the purpose is pure entertainment. Everyone smiles when The Screen Machine rolls in, bringing mobile cinema to remote, rural communities far from any modern multiplex. Trains don’t always arrive on time. Nor do boats. But, on the island of Barra in the Outer Hebrides, the talk in January was of whether the cinema would arrive on time. “I’m not sure the screen machine will get here by Monday, what with the storms and everything,” said a lady in Macroon’s tea room. “Though the screen machine is a wonderful thing,” she added, lingering over the words ‘screen machine’ as if it were a rare species of animal. She then turned her attention to a sultana scone. The screen machine is indeed a wonderful thing. 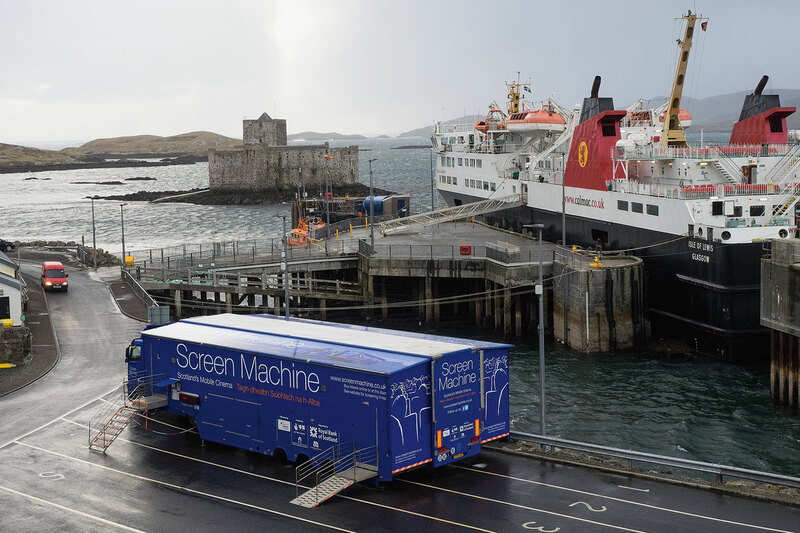 Scotland’s travelling cinema regularly tours the country’s island communities and remoter parts of the mainland, generally stopping off for a night or two in each place. Barra was lucky. There was a brief lull in the storms and, in the wee small hours of a Sunday morning, the huge truck was loaded onto the MV Isle of Lewis in Oban. “Not a nice time of day to have to travel,” was the consensus in Macroon’s when the word went round that the boat, normally timed to leave Oban in the early afternoon, would weigh anchor and set sail at 4.30 in the morning.